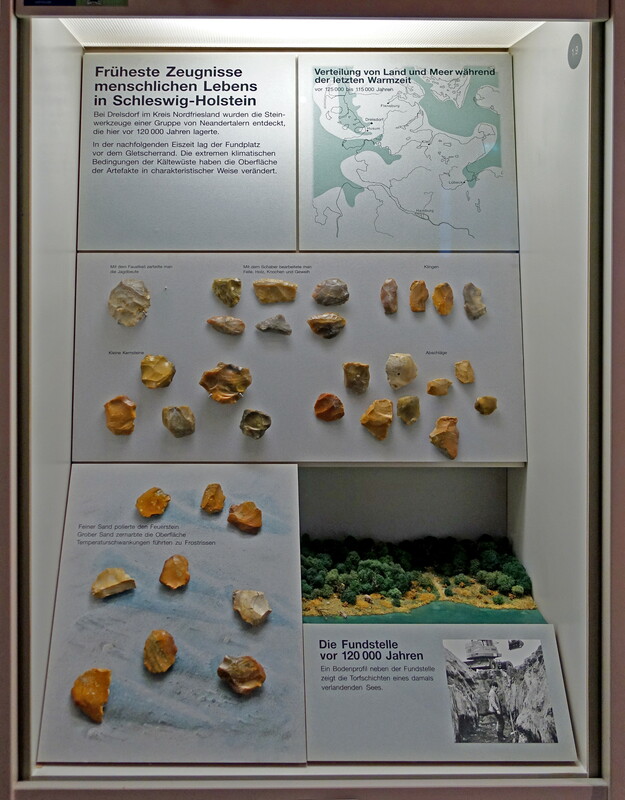 Earliest evidence of human life in Schleswig-Holstein. At Drelsdorf in the district of Nordfriesland, the stone tools of a group of Neanderthals, who camped here 120 000 years ago, were discovered. 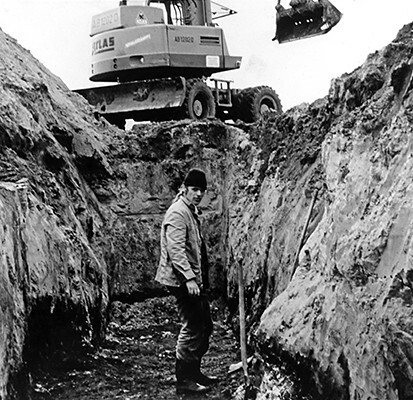 In the subsequent ice age, the site was located in front of the ice sheet edge. The extremely cold climatic conditions have changed the surface of the artefacts in a characteristic way, giving them a patina they would not otherwise have. 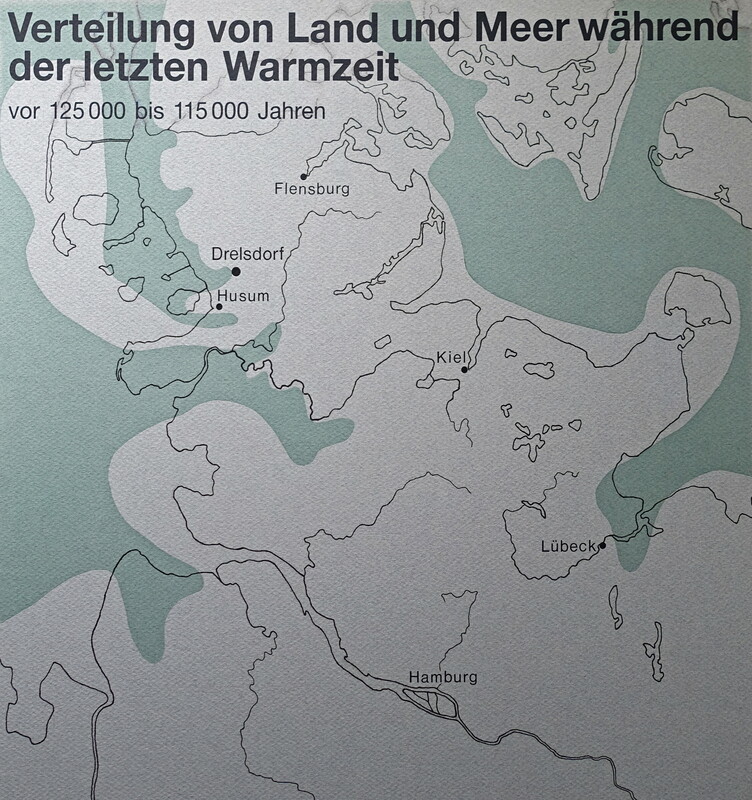 Distribution of land and sea during the last warm period, between 125 000 BP and 115 000 BP. 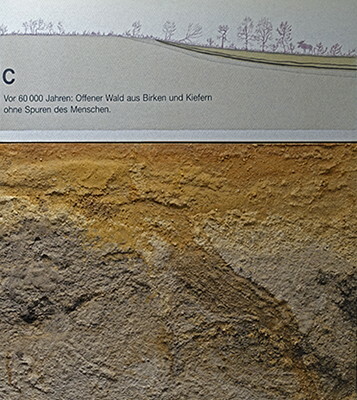 Drelsdorf, circa 120 000 BP. 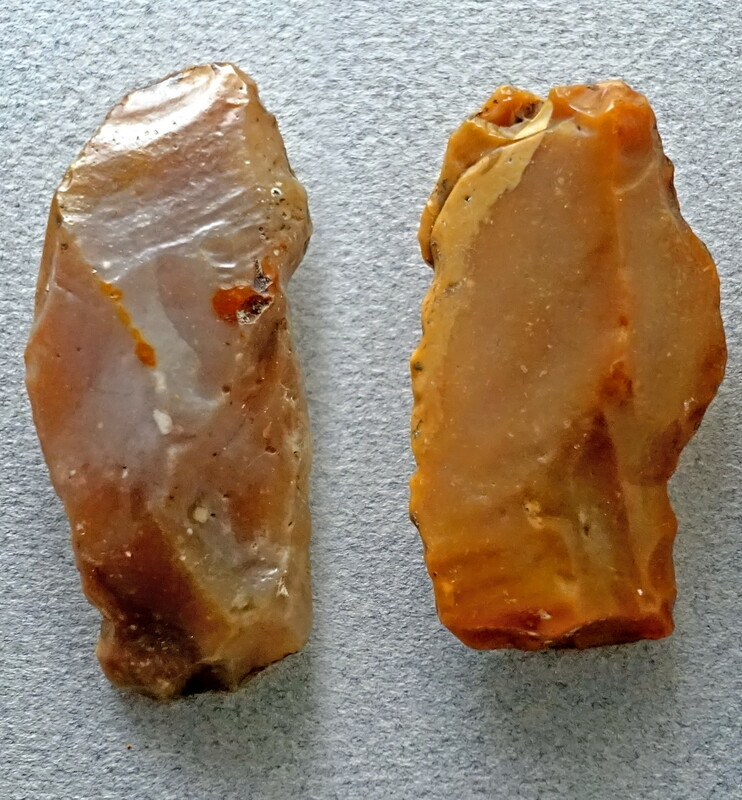 Hand axes were a universal tool, but were also used to cut up game. 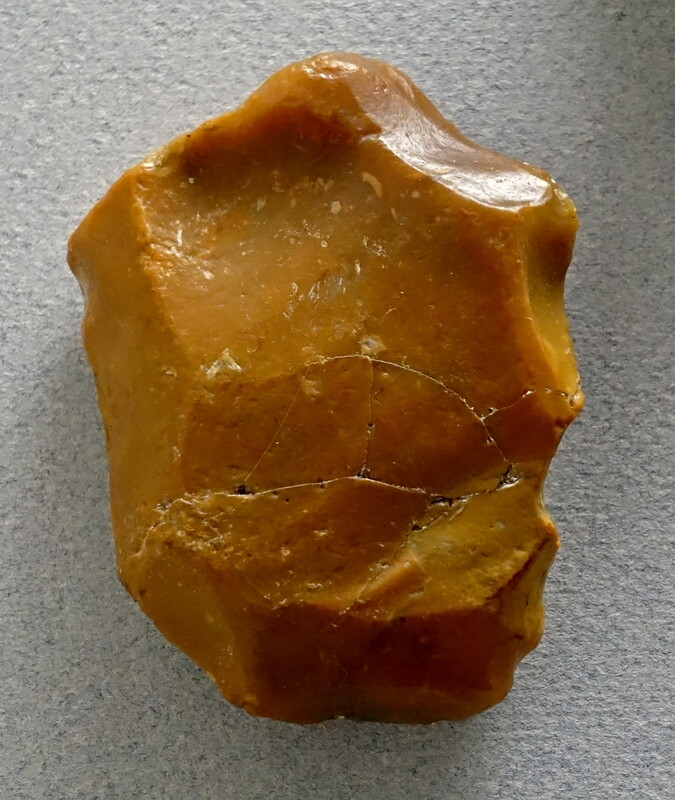 The scraper was used to work on skins, wood, bones and antlers. 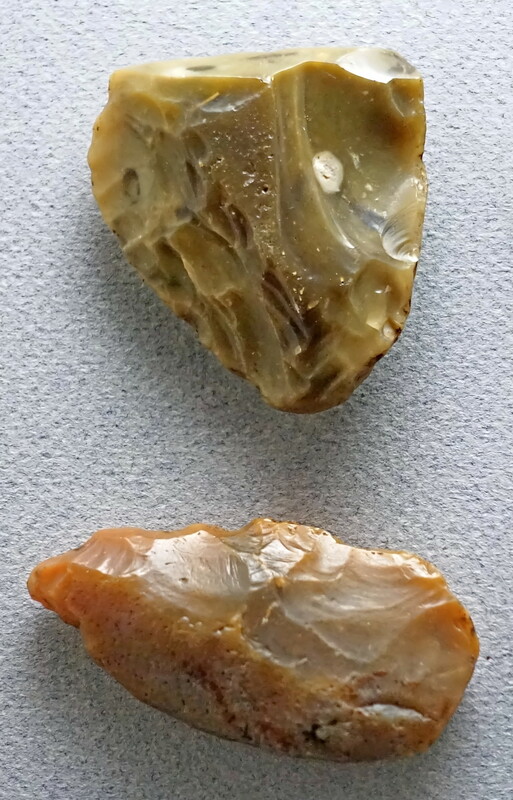 Small cores or nuclei, the remains after as many flakes had been knapped from them as possible. 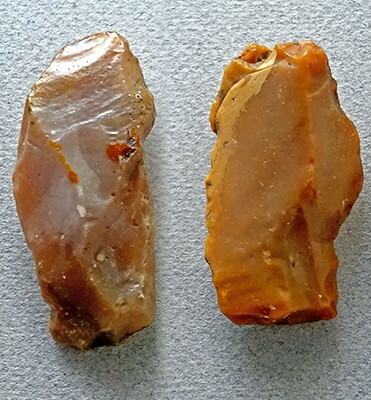 The neanderthal dig at Drelsdorf, which discovered artefacts from 120 000 years ago. 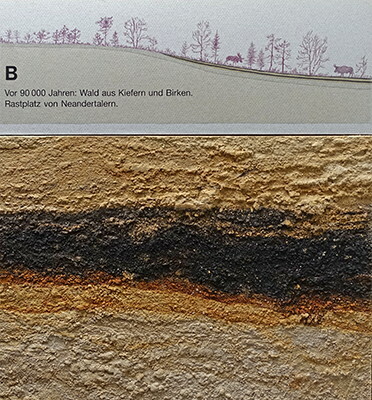 The soil profile shows the peat layers of a lake in the process of silting up. Fine sand polished the flint. 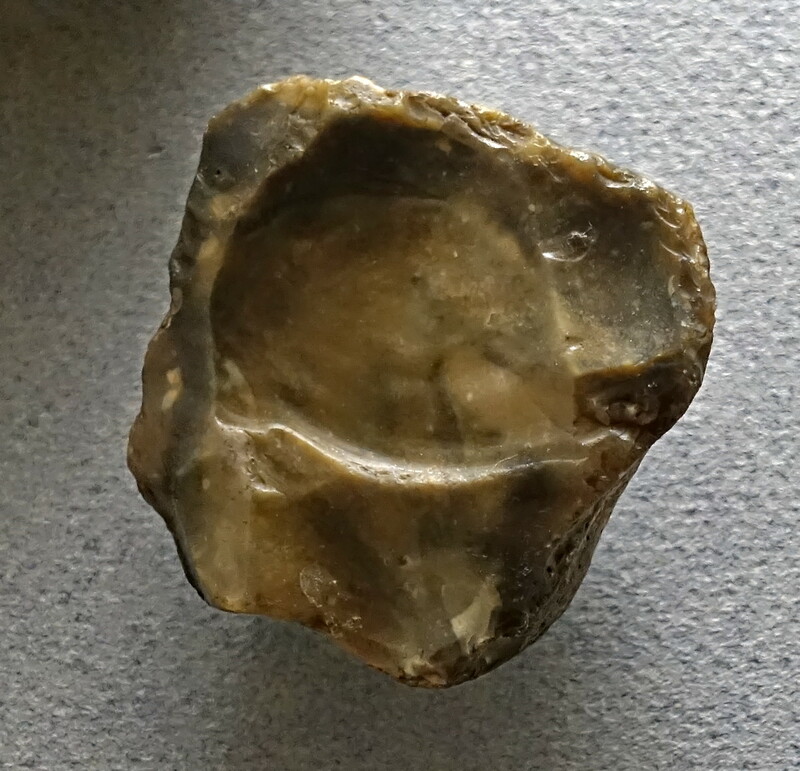 Larger sand grains caked the surface. 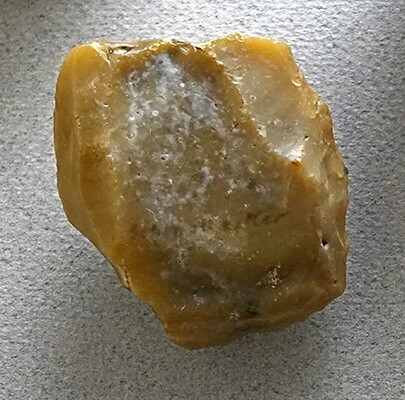 Temperature fluctuations led to frost cracking. 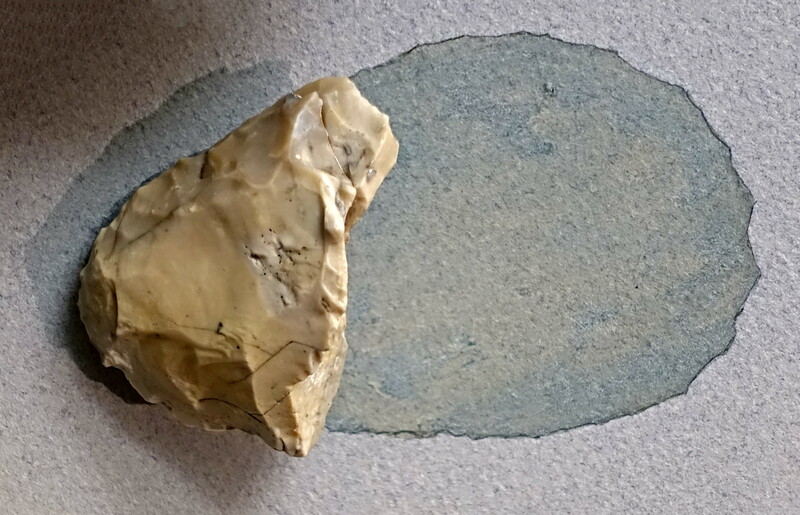 The environment of the Neanderthals. 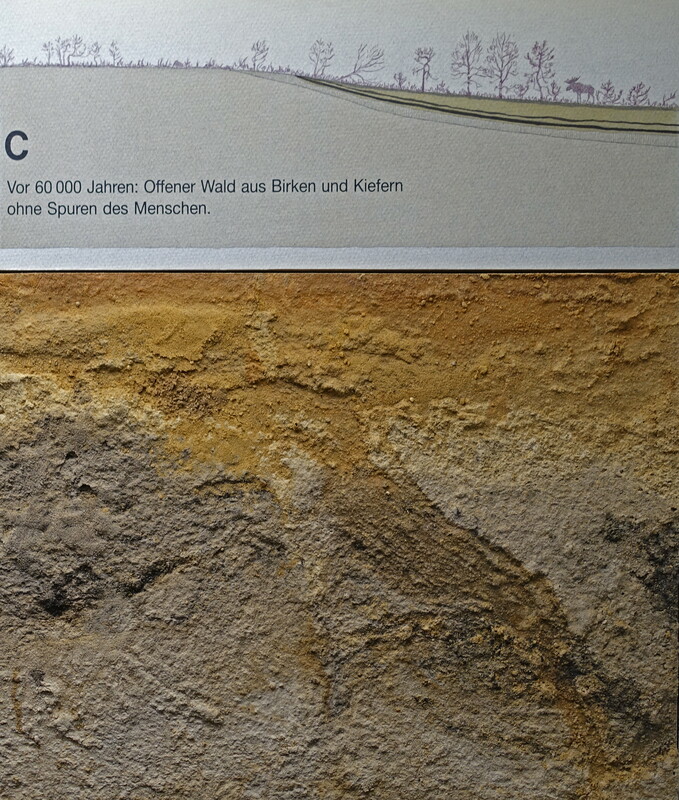 A sand pit at Schalkholz, Kr. 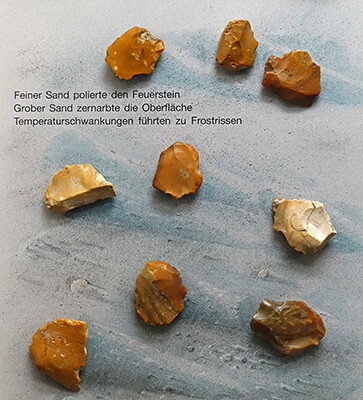 Dithmarschen gives an insight into the climate history at the time of Neanderthal man. 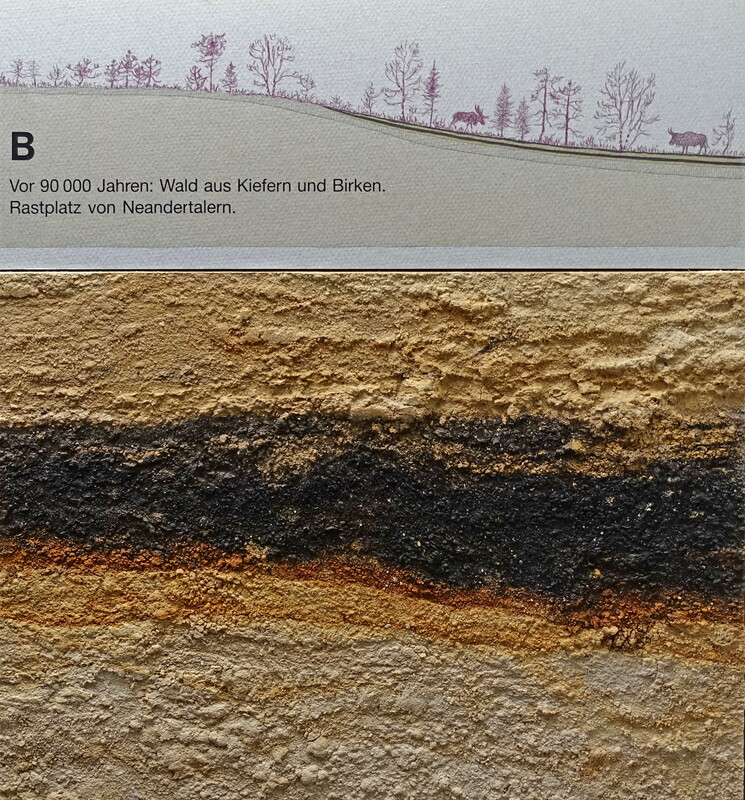 The dark humus layers were formed in a warm period (A) and two slightly cooler climates (B, C) at the beginning of the last ice age. In between there are cold periods of several thousand years. 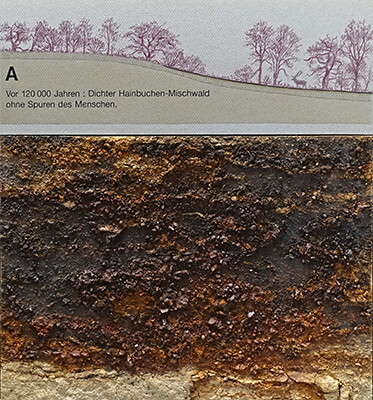 Layer A: 120 000 years ago: Dense hornbeam mixed forest without traces of man. Schalkholz, layer B: 90 000 years ago: A forest of pines and birches, visited by Neanderthal people. In this dark layer were individual flint tools. 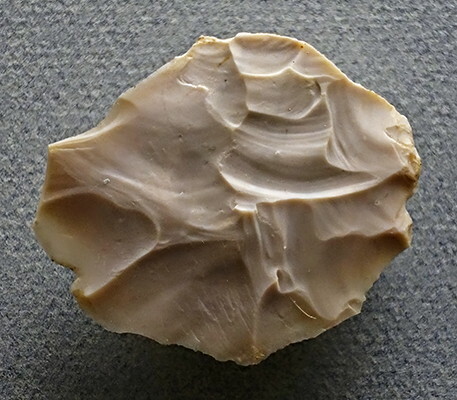 They were quickly covered by sand and gravel layers and therefore look freshly knapped. Schalkholz, circa 90 000 years ago. These are some of the pristine condition tools found in Layer B.
Schalkholz, layer C: 60 000 years ago: open forest of birch and pine without traces of man. 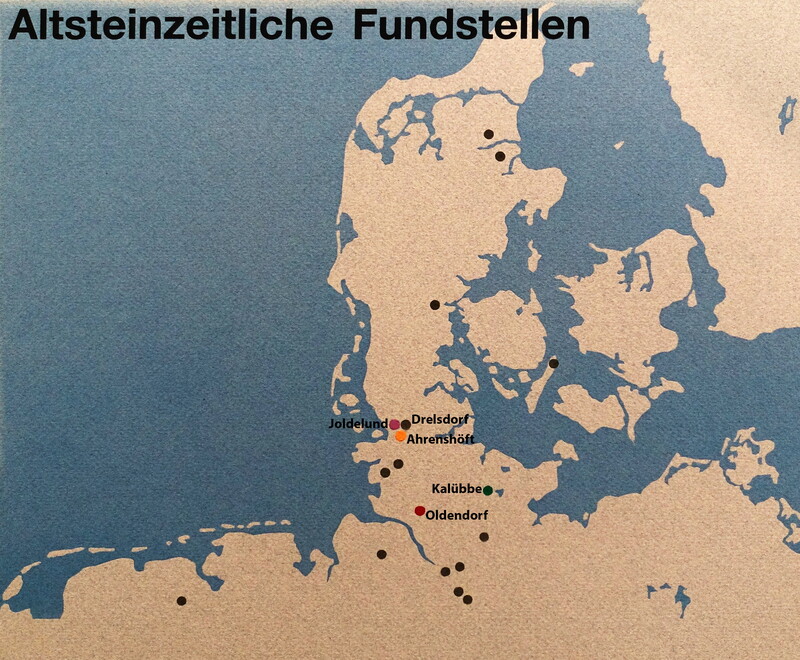 Sites from the Old Stone Age in or near the Schleswig-Holstein area. 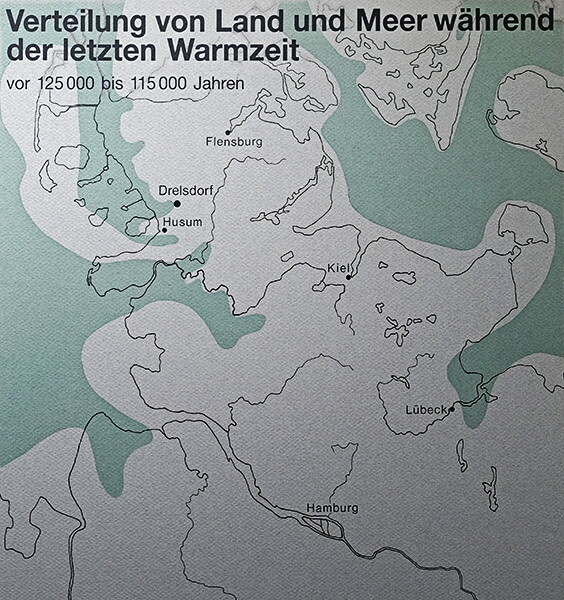 Ahrenshöft, Drelsdorf, Joldelund, Kalübbe, and Oldendorf. Left: Hand axe, from Joldelund. 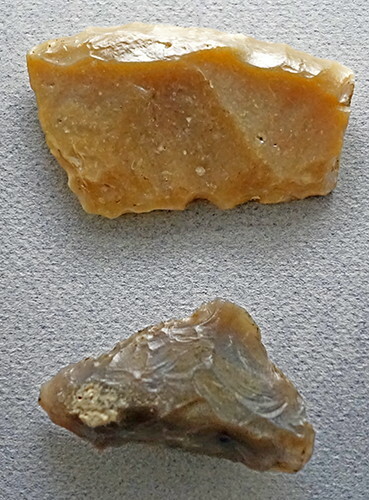 Right: Tool made from a flake, Ahrenshöft. The remains of a hand axe, from Oldendorf. The suggested original outline of the axe may be seen from the well executed and artistic pen and watercolour outline. 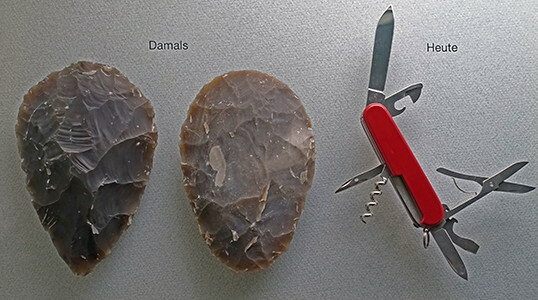 The Swiss Army Knife of the Palaeolithic. 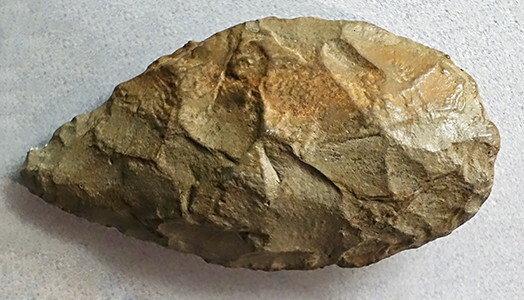 For more than a million years, the hand axe was the most widely used universal device of man. The change in the form and technique of manufacture over the course of the millennia makes it possible to determine the age of these devices. 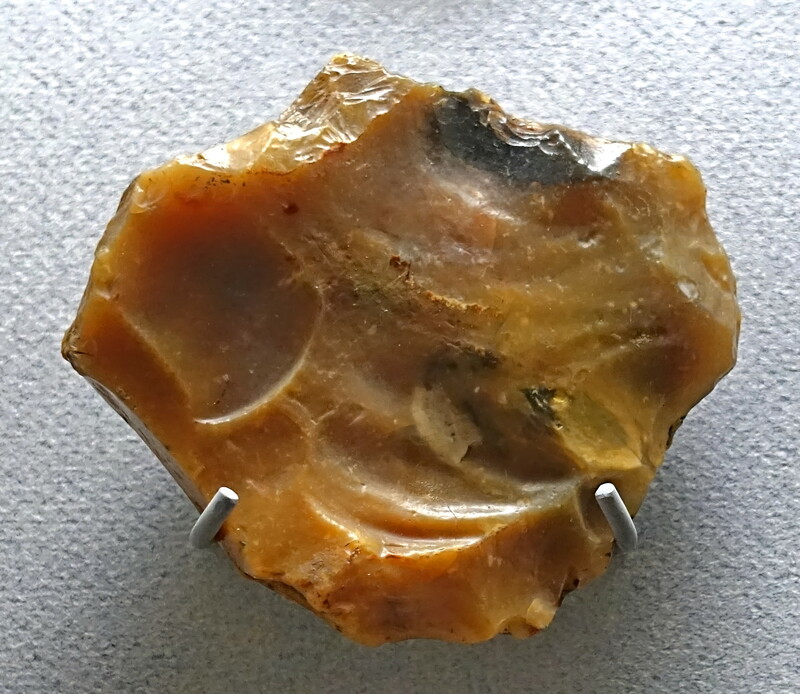 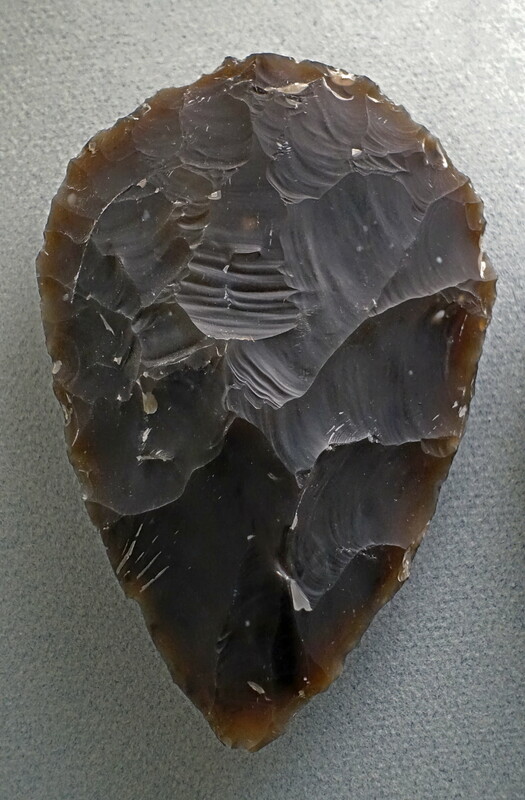 This is a superb example of a hand axe, made of high quality flint, and by a master Neanderthal craftsperson. 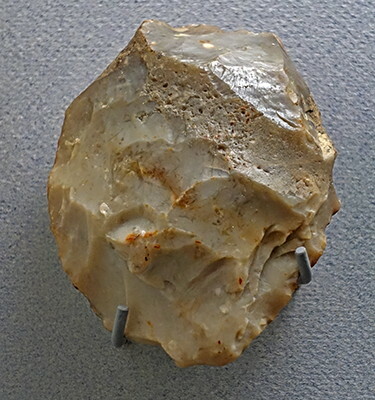 Highly symmetrical hand axe, with a uniformly thin and sharp edge. 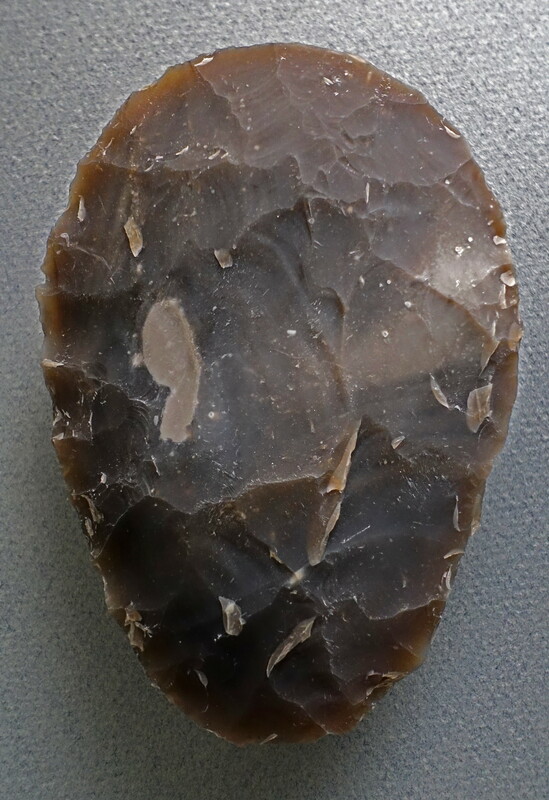 Anyone who doubts the humanity of the Neanderthal peoples need only look at a tool such as this to be disabused of that notion. 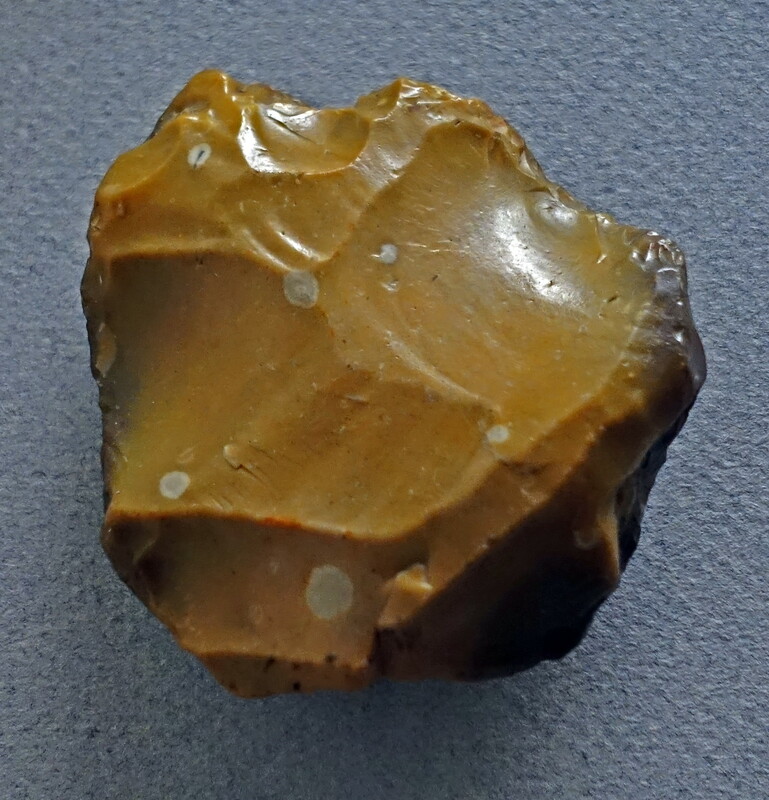 It is a tour de force. Nothing speaks to the skill and intelligence of the maker more than the level of care and artistry used in the fashioning of tools like these. 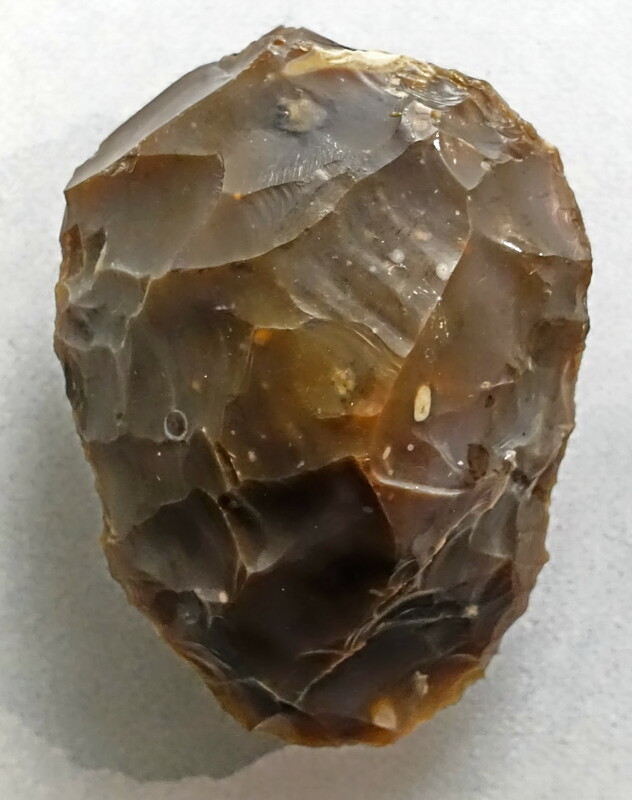 The amount of time and effort and knowledge of the craft used here is far more than is required for such an item. Yet we take pride in our work, and make sure that our creations are as good as we can make them. 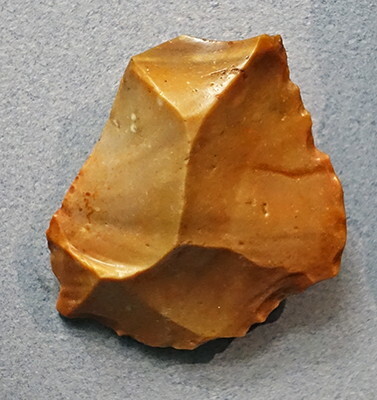 The first tools were much like this one. A piece of water worn river stone was picked up, and hit against a much larger rock in the river bed, and in a few minutes a very serviceable, sharp edged, hand held axe blade was created. 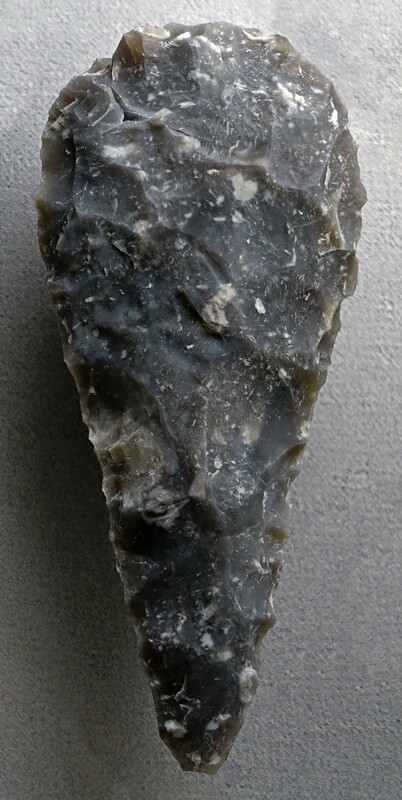 A tool such as this could be used to gnaw at a sapling, and in a few minutes a pole could be broken off which could then be used for levering up a large rock to be used for some purpose, or the pole could be used, along with others, as part of a shelter. 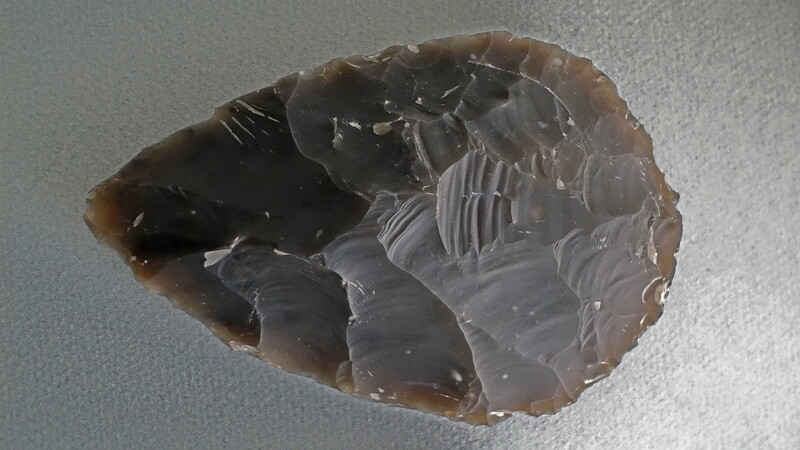 The tool could also be used to cut into a carcass of a reindeer or aurochs, and chop out a useful cut of meat, to be tossed onto the coals for the evening meal. 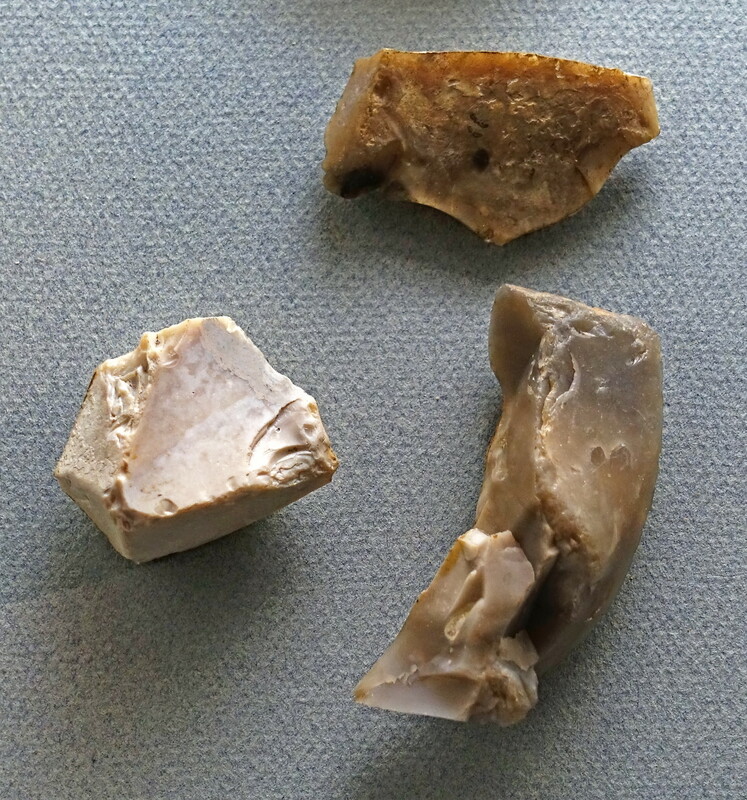 It could be used to crack open the leg bone of a horse to extract the fatty and nourishing marrow. This was what we used for hundreds of thousands, perhaps millions of years. 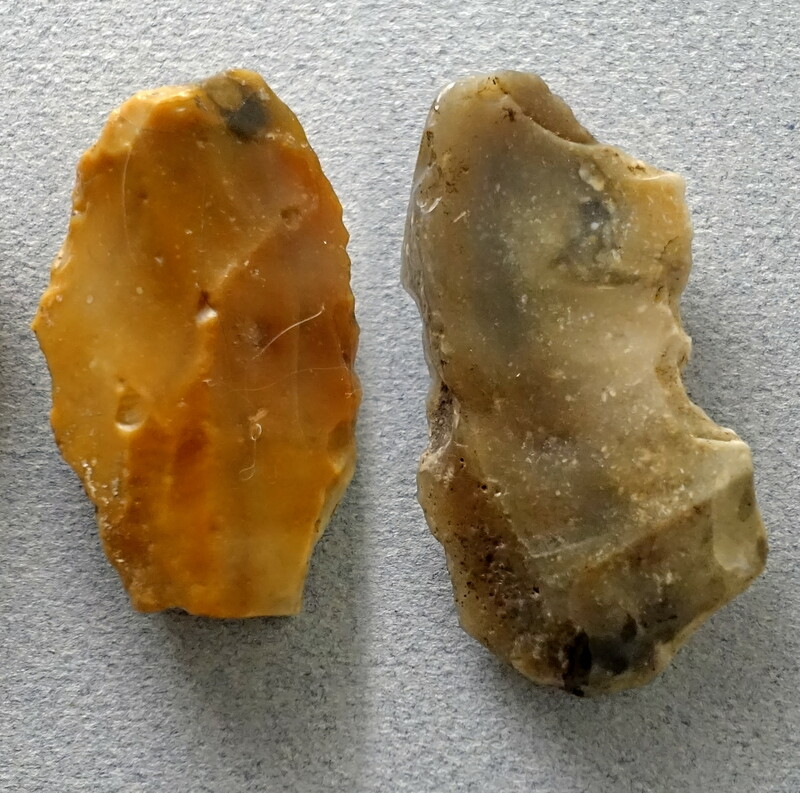 But eventually we wanted more useful and specialised tools. When I need to pound in a tomato stake to use to support a newly planted tree, I often pick up one of the basalt rocks on my place lying near to hand, rather than going to the shed and getting out a steel hammer with a wooden handle. The rock does the job perfectly well. But if I am putting a nail into a piece of wood, a better tool is needed. Biface hand axes (often the name is truncated to just 'biface') became ubiquitous from circa 500 000 BP, valued for their ability to perform many functions. 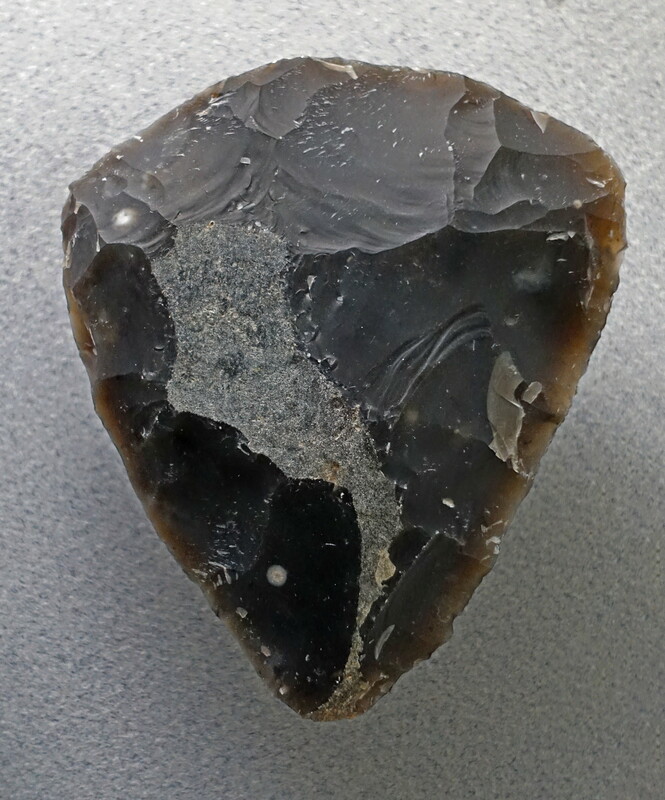 This is a beautiful example of a Micoquian culture hand axe, distinctively shaped. Hand axes went through a number of different styles, becoming steadily more skilfully and (usually) more symmetrically made. 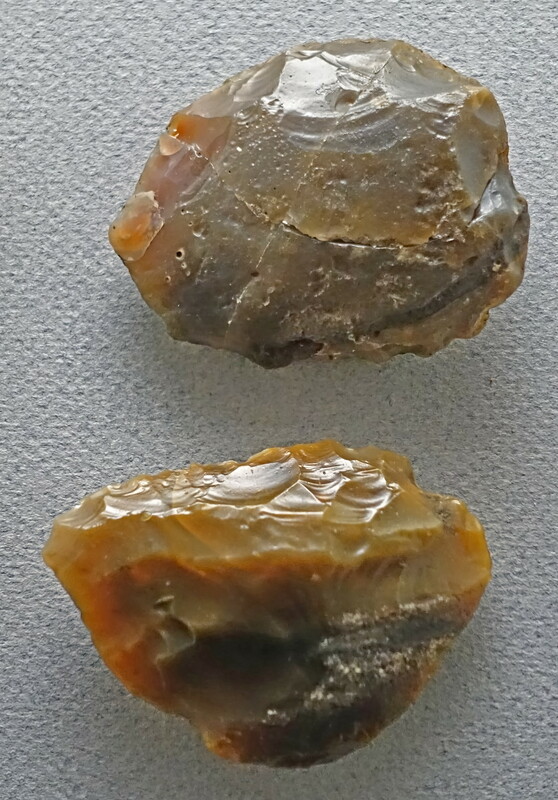 However the Micoquian style had distinctly asymmetrical faces, when comparing one side to the other, while being symmetrical on any one face, as shown here. 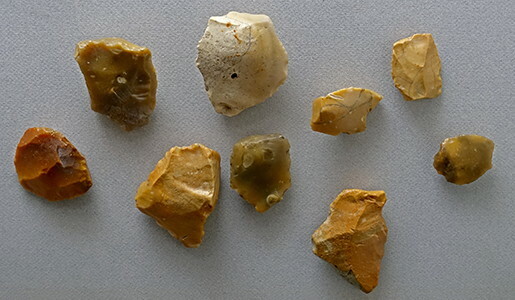 Despite this, they were still being made at the eponymous site of la Micoque in the very late time frame of 80 000 BP - 50 000 BP, at about the time that Neanderthals and their distinctive tools were disappearing from the fossil record. 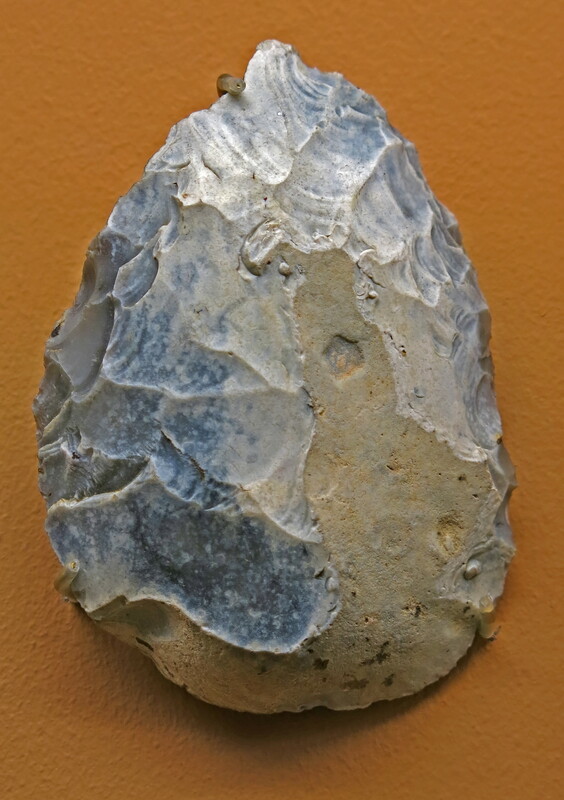 Another beautifully made hand axe. 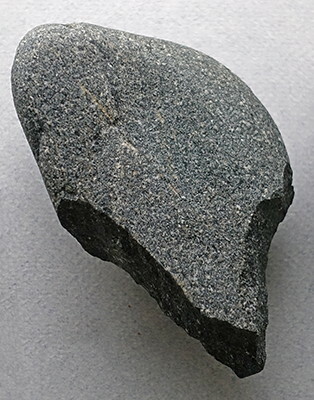 Millions of these were made.